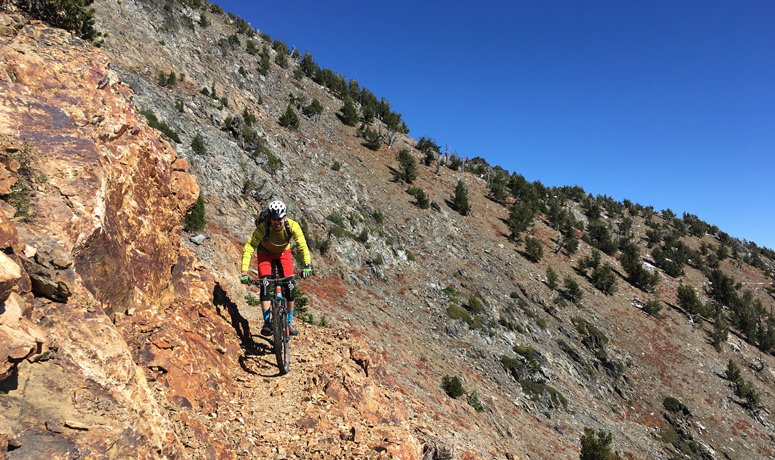 If you’re the kind of rider who equates extreme punishment with equally extreme reward, we have the trail for you. 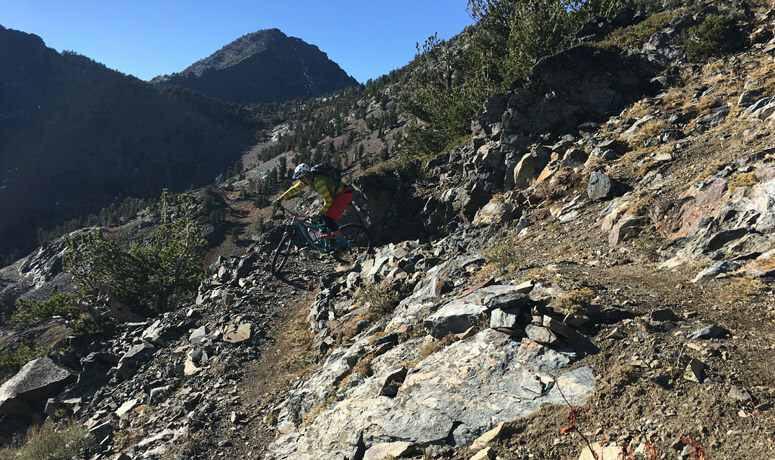 Put in the hard work early on the Elkhorn Crest Trail, and the rest of the ride will feel like straight payoff: views to forever in all directions, enough technical challenge to make your palms sweat, isolated mountain lakes and old miningclaims, and a hair-raising final descent that will correspondingly raise in your adrenaline levels. Of course, some riders actually enjoy a little suffering – for a good cause. So gird yourself to attack the first 9 miles of the road to hell. Well, not really, but it’s not easy. You’ll follow loose double-track that works its way precipitously up the ridgeline; you’ve got 3,500 feet of ascent to the top. Distract yourself all you can by focusing on the crisp air, the scent of pine on the wind and the pleasingly varied landscape and geology on the way up toward Marble Pass. Once you bust out on top of the world, the route transitions to the single-track trail. And this single-track is not for the faint of heart. Your legs and lungs will be thanking you for the break as you roll along the ridgeline, but your eyes, hands and sense of balance will be on double-alert as you go into full technical-riding mode. It probably goes without saying that the views up here are breathtaking – but don’t pay attention to them unless you’ve stopped the bike. Your focus needs to be on the narrow and rugged trail, which demands your full arsenal of moves to navigate the rock notches, outcroppings and precipitous ledge cuts. You have a couple great reasons to stop every so often: the views, and the fact that a fall out here is something you need to avoid. Stay sharp and fresh. While you’re up here, be sure to revel in the splendid solitude (assuming you didn’t find anyone else willing to do this). 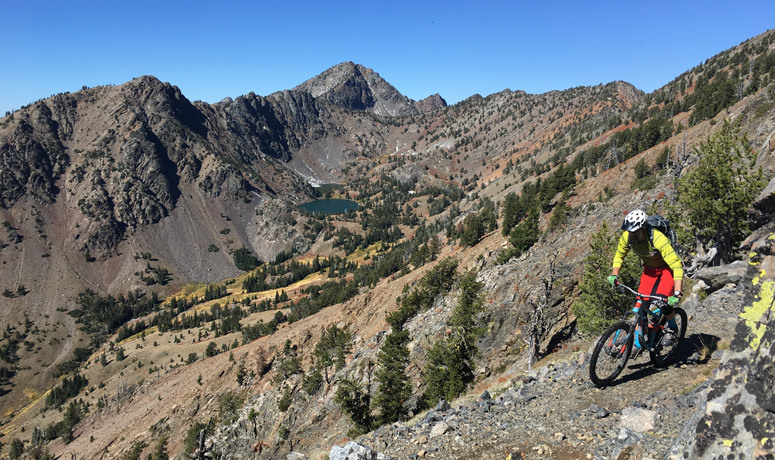 You’ll feel like you’re on your own private playground up here – this is the essence of back-country riding, distilled down to one route. Your turnaround point is an old mining claim, about 11 miles into the ride. Take the time to poke around a bit; you’ll find a piece of “art” that will make your trip that much more memorable. Like the best out-and-back trails, the experience feels different enough going in the other direction that you’ll enjoy retracing the route for a while. 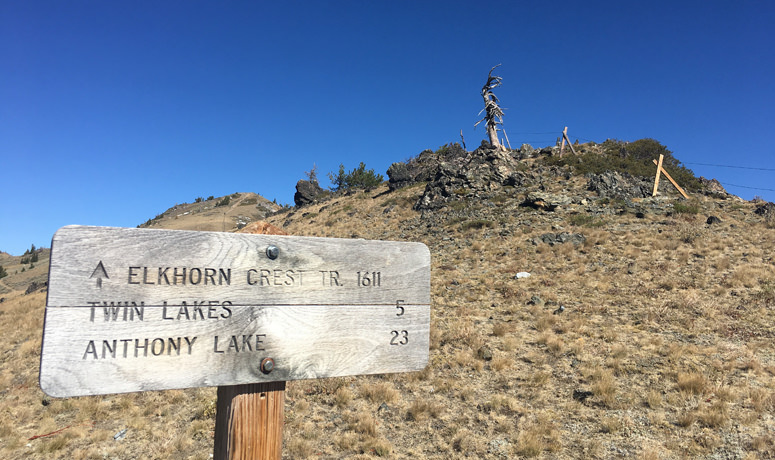 But eventually you’ll be snugged up against the bulk of the trail namesake, Elkhorn Peak –it’s here you’ll join the Twin Lakes trail for the rest of the ride. Twin Lakes is good enough to be a great ride just itself; in this case it just adds to the epic day you’re experiencing. You got up here on double-track, but you get to go down on tight switchbacks somehow carved into the rocky terrain. Dance with the G-forces as you serpentine your way down; along this stretch you’ll be adjacent to the twin lakes that give this trail its name – two cool, clear bodies of cirque-fed water that beg for a photo. 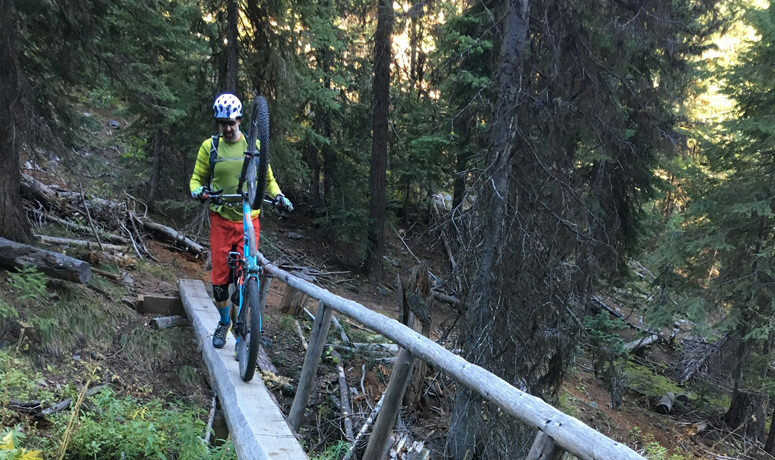 This stretch is sublime single-track, a plunge that zig-zags down into the forest and is punctuated by rocks, roots, and even a bridge built of a single log. You’ll drop 3,000 feet, smiling all the way, before you hit the last segment – three miles of double-track that drops you all the way back to your starting point. At this point, the pain of the first hour has receded. It was totally worth it. Note: The trail goes up above 8,000 feet, and therefore is completely impassable in the winter, spring and sometimes even early summer. But once it’s clear it’s normally good through the fall, until the first major snow.